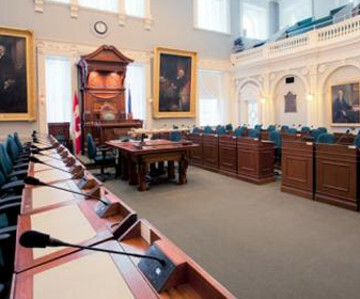 The Nova Scotia Legislature is the legislative branch of the Government of Nova Scotia. It is made up of democratically elected representatives (the MLAs) who form the House of Assembly, and the Lieutenant Governor. The Legislature makes laws, controls provincial public spending, and monitors and questions the executive branch’s policies and actions. Follow the proceedings of the House by searching the latest debates (Hansard), bills and statutes, and events. Historical paintings, portraits, artwork, furnishings and ceremonial objects in the Province House collection.